While you are cautious about your choice of food during weight loss, a little more effort in choosing the right packaged food can not only make your weight loss mission easy but also boost your heart health. 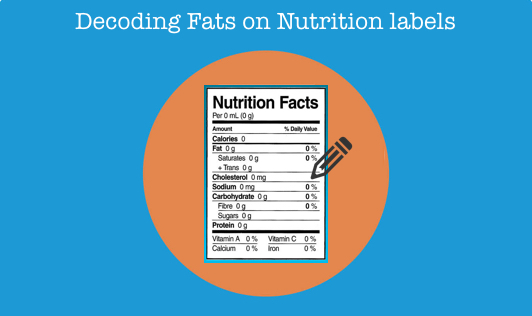 In this article we decode different types of fats as seen on nutrition labels. So what do we consider as high fat and low fat? High Fat: A product which mentions as 15% per 100 g as total fat is high. Low Fat: Any product that mentions 5% per 100 g as total fat is low. This tells you how much of saturated fats is there in 100 g of food. Remember, intake of this type of fat is one of the main causes of heart diseases. High: More than 5% of saturated fat per 100 g of product is not recommended. Low: Look for products with less than 1.5 g of saturated fat per 100 g. These are safe. What does the label ‘low fat’ or ‘reduced fat’ mean? Just because the word ‘low fat’ or ‘reduced fat’ is highlighted on the pack, it doesn’t necessarily mean it is healthy. A low fat product may simply mean that it is 30% less in fat when compared to its equivalent. So if the type of food you choose (Eg: Mayonnaise) is already too high in fat, even if you pick a low-fat version of it, it is still going to be high in fat. Also, such foods are not low in calories. Infact, fat is often replaced with sugar, so you end up consuming the same amount of calories even if the pack claims to be ‘low fat’. Therefore, it is always safe to be sure about the fat content, sugar content, and calories of food, by reading the nutrition label carefully before purchase.